An exiled Muslim cleric whom Turkey's president has accused of orchestrating a failed coup attempt denied any responsibility Saturday, saying he had no knowledge of the plot. 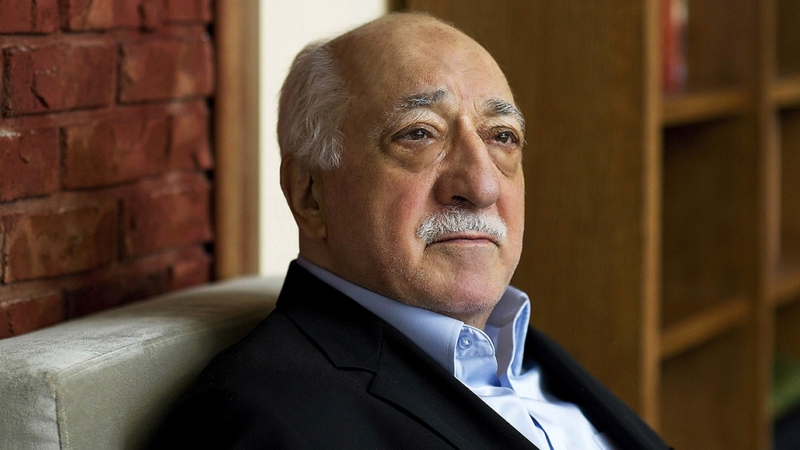 Fethullah Gulen told reporters at his Pennsylvania compound he knows only a "minute fraction" of his legions of sympathizers in Turkey, so he cannot speak to their "potential involvement" in the attempted coup against President Recep Tayyip Erdogan. The reclusive cleric, who very rarely speaks to reporters, talked about the failed overthrow attempt shortly after Erdogan demanded that the United States extradite him. U.S. Secretary of State John Kerry said the Obama administration would entertain an extradition request but Turkey would have to prove wrongdoing by Gulen. Turkey's President is blaming a man in Pennsylvania for the attempted Coup on Friday. The cleric, who lives in a large complex in the Pocono Mountains, denied any role in the attempt. Looking frail, Gulen, who is in his mid-70s, sat on a sofa in a large reception room outside his living quarters, with an aide taking his blood pressure before the news conference. He said he wouldn't have returned to Turkey even if the coup had succeeded, fearing he would be "persecuted and harassed." "This is a tranquil and clean place and I enjoy and I live my freedom here. Longing for my homeland burns in my heart, but freedom is also equally important," said Gulen, who lives on the grounds of the Golden Generation Worship & Retreat Center, an Islamic retreat founded by Turkish-Americans. He has criticized Erdogan, his onetime ally, over the Turkish leader's increasingly authoritarian rule. The Erdogan regime has launched a broad campaign against Gulen's movement in Turkey and abroad, purging civil servants suspected of ties to the movement, seizing businesses and closing some media organizations. In the United States, a lawyer hired by the Turkish government has lodged numerous accusations against a network of about 150 publicly funded charter schools started by followers of Gulen, whose philosophy blends a mystical form of Islam with staunch advocacy of democracy, education, science and interfaith dialogue. Nobody associated with the U.S. schools has been charged with wrongdoing. Given the chance to deliver a message to Erdogan, Gulen demurred. About 150 supporters of Erdogan protested outside the compound Saturday, chanting and waving signs.